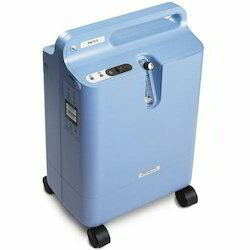 Providing you the best range of oxygen concentrator, philips respironics everflow oxygen concentrator and oxygen nasal cannula adult 7.5 meter for oxygen concentrator with effective & timely delivery. Oxygen Concentrator EverFlo is part of the freedom series of oxygen therapy products from Philips Respironics designed to deliver clinically superior treatment. Until now most oxygen concentrators have been bulky, heavy and require on going maintenance by patients and home care providers. 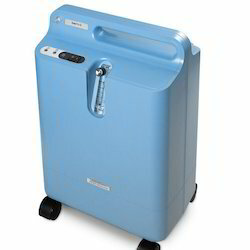 But the 5-Liters per minutes EverFlo stationary concentrator from respironices has been designed with a unique set of features to lower the costs of providing oxygen therapy while maintaining ease of use for patients. Light weight and easy to transport at 31 pounds. Compact design takes up to less space, looks less like a medical device. One of the quietest mainstrem concentrators. No filters for the patients to change. Owing to the assistance of deft professionals and ultramodern production unit, we have become a trusted organization to provide the best quality array of Philips Respironics Everflow Oxygen Concentrator. This concentrator is designed and manufactured by our ingenious professionals with the use of optimal quality raw materials and pioneering techniques. The offered device is used in various health and medical applications for increasing the concentration of oxygen in body. Besides this, we are offering this concentrator to the patrons at marginal prices. Compatible With All Brand Oxygen Concentrators. 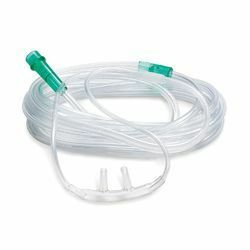 ONTEX oxygen nasal cannula is manufactured from soft, non-toxic PVC thus non irritating even in long term use.System of attachment provides maximum freedom to the patient and leaves the patient’s mouth free for nutrition & communication. Twin bore/ nasal tips are designed to ensure equal volume of oxygen to both air passages.Soft funnel shape connector facilitates easy connection to the oxygen source. Multichannel tube ensures the supply of oxygen even if the tube kinks accidentally.